Our project on the future of healthcare is organized into two phases. In the first phase of the project we develop a measure of “automatability”. This measure is created through ethnographic fieldwork: close observation of all occupations in Primary Care to gather data using interviews, fieldnotes, document collection, and photographs. We then use this detailed data to create a description of each occupation in primary care, the tasks they perform, and features and characteristics of those tasks. Our final report on phase one of this research is released in early 2019. We continue to publish important findings for Primary Care and the NHS, catalogued under research. The second phase of the project extends this research, engaging patients, policy stakeholders, system leaders, and other parts of the NHS. Investigating three critical areas that emerge from phase one. 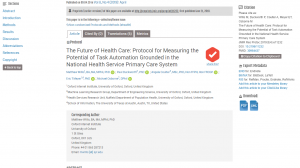 First, to develop a model to inform the design of work tasks of healthcare professionals. Second, to identify design guidelines, partly informed by our previous analysis, for human-machine interactions. Focused on what kinds of workflows should be preserved for human workloads. Third, to investigate the potential impact of automation on the patient experience with their GP.